This years birthday cake. Twenty-one! The truth, I don’t usually celebrate. Call it elitist or detached (or both), but rejoicing age, another year older, has never been something I yearned for. I blame my love for American Beauty on the sort-of self-deprecating ideals that stem. The kind of societal ideals that entail certain life’s milestones to be reached within the perimeters of a new age. A kind of pursuit in identity and self-obsession, that always set my warped line amongst the straight. A good cake, that’s the extent I’m willing to go. This Chocolate Hazelnut Cake with Gianduja Praline Swiss Meringue Buttercream is for those that have stuck by with me through it all, the highs and lows. We’ve seen each other’s progression and shared an unwavering pathological need for the sweeter things in life, more cake and more beauty. I worked hard on this and I wish I could share a slice of this cake with you all. So, let’s celebrate ourselves rather than age together. Chocolate Hazelnut Cake with Gianduja Praline Swiss Meringue Buttercream. It’s a riff on the classic chocolate, complete and utterly beloved at all birthday celebrations. It’s an ode to being extra and screwing with tradition. And it’s probably the best chocolate cake to come out of my kitchen. Because well, hazelnut. The discovery of hazelnut was a lucky lack-of-flour fluke. And one, that fully incites the term the ‘best ever’. I spent a few weeks testing recipes that proclaim to be the ‘best ever chocolate cakes’...they were good but each lacked a certain flavour profile and textural notes that made a cake, irresistible. 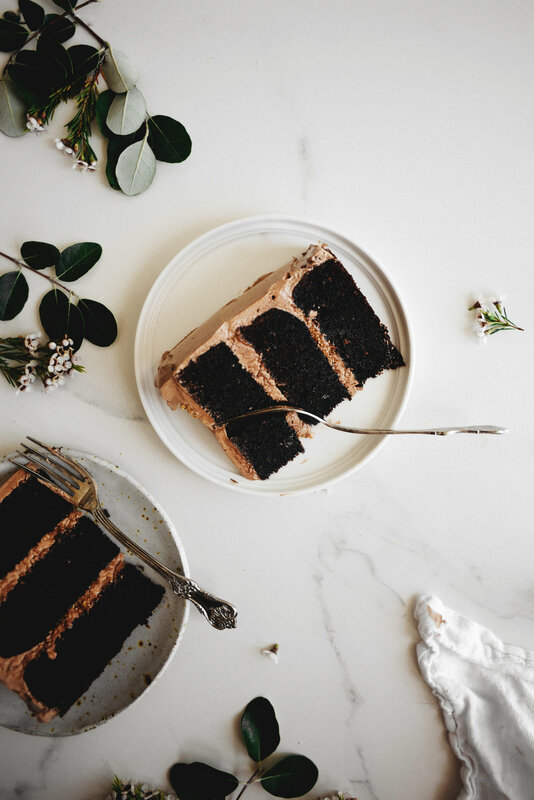 This Chocolate Hazelnut Cake with Gianduja Praline Swiss Meringue Buttercream is comprised of three dense, rich and fragrant layers of an incredibly moist chocolate hazelnut cake. In between each layer is a thick spread of an impossibly silky smooth gianduja swiss meringue buttercream (that’s also spiked with hazelnut liquor!) and a generous amount of hazelnut praline, for texture and an extra dose of that infamous nutty rich taste. The smell and moistness of these cakes is everything. The taste, even more so. I can’t proclaim my undying love for it enough. I’ve always believed that hazelnuts contain addictive properties. It’s the only way to explain the world’s fascination with Nutella. They’re my choice of crack, with opium-esque all enslaving qualities. We ride or die together. If I could coax my body into developing filbertone (the main compounding flavour in hazelnuts) scented pheromones, I would. As for the frosting, I knew I wanted a buttercream that was just so good. And a Gianduja Swiss Meringue Buttercream it was. It’s light enough to offset against the chocolate hazelnut cakes, but rich enough to compliment and pair with the taste. If you haven’t had gianduja before, it’s like this chocolate hazelnut hybrid. A kind of luxurious and solidified counterpart of Nutella. But way better because it has 30% of pure hazelnut paste mixed into it’s rich body. It melts on the tongue, and is desired enough so that only speciality stores carry it. You could use a milk chocolate as it’s replacement, but do the extra leg work and find it. I brought mine back from New York, but you can easily purchase it online. Purchase more than you will need though, because trust me, you’ll crave it in all your baked goods…or straight, if that’s how you roll. You won’t regret it. Pre-heat the oven to 180 C (350 F). Grease and line 3 x 18 cm (7 inch) cake tins with parchment paper. Set aside. Sift the cake flour, hazelnut meal, cocoa powder, baking powder, soda and salt into a large mixing bowl. Stir in the sugar. Remove from the oven and let the cakes cool in their tins for 15 minutes before turning out and onto a wire rack to let cool completely. Once the cakes have cooled, level off any domed tops with a serrated knife or cake leveller then set aside for assembly. Place the hazelnuts in the middle of a slipmat or baking tray lined with parchment paper. Set aside. Remove the saucepan from the heat and pour the mixture all over the hazelnuts, making sure that they are all coated. Let sit until completely cool, about 30 to 45 minutes. Once completely cool, break the hazelnut praline into small shards then place them in a food processor and blitz to form a finely texture crumb. Place them in a bowl and set aside for assembly. Place the finely chopped gianduja and dark chocolate into two separate medium sized bowls set over saucepans of barely simmering water. [i]Do not let the bottom of the bowl touch the water[/i]. Heat each chocolate, stirring with a rubber spatula often, until smooth and melted. Remove the bowls from the heat and let cool. Heat the egg and sugar mixture, whisking often, until it reaches 70 C (160 F) on a candy thermometer. The sugar should be completed dissolved and the mixture hot to the touch. Once the mixture is at temperature, carefully remove the mixer bowl from the heat and place it onto the stand mixer fitted with the whisk attachment. Whisk the egg white mixture on medium-high speed, for 8 to 10 minutes, or until it holds medium to stiff peaks. The bowl should no longer be hot to the touch and the meringue should be glossy and cool. Stop mixing and swap out the whisk attachment for the beater attachment. Set the mixer speed to medium-low. Add in the butter, a tablespoon at a time, until it is all incorporated. Beat in the hazelnut liqueur and vanilla bean extract and the melted and slightly cooled gianduja and dark chocolate. Increase the mixer speed to high and continue to beat until the buttercream is thick, silky smooth and very fluffy, about 4 to 6 minutes. To assemble the cake, place the first levelled cake layer, cut side facing up, on a cake stand or serving platter. Use an offset spatula to spread about 3-4 tablespoons of the buttercream over the top of the cake then sprinkle over a generous amount of the crushed hazelnut praline, almost to the edges. [i]Make sure not to get the praline to the edges of the cake, otherwise when you do a full buttercream coat of the cake - you may get a few stray praline crumbs on the outside[/i]. Gently press on the next cake layer and repeat by spreading over 3-4 tablespoons of the buttercream on the second cake layer then sprinkling over a generous amount of the crushed hazelnut praline. Top with the final cake layer, cut side facing down. Spread a thin layer of the buttercream over the entire cake to crumb coat it. Set the cake in the refrigerator so that the buttercream can harden - about 30 to 45 minutes. Once the buttercream has hardened, spread the remaining buttercream over the cake in a thick, smooth layer. Finally, place the cake again in the refrigerator to set the buttercream before serving, about an hour. Before slicing and serving, you can sprinkle over a bit of the remaining hazelnut over the top. You can also decorate the cake with pesticide-free flowers, if desired. Seal them on-top of the cake with a dollop of any extra buttercream.